WELLESLEY, MA--(Marketwired - November 26, 2015) - The Internet of Things (IoT) is in its early stages but already there is significant revenue to be attained in the components segment of the market. BCC Research has determined that the total market for IoT devices and chipsets is expected to grow from nearly $4.2 billion in 2014 to close to $49.2 billion in 2020 at a compound annual growth rate (CAGR) of 49.3%. IoT devices are expected to account for an overwhelming percentage of this growth, going from $4 billion in 2014 to almost $48.4 billion in 2020, a CAGR of 49.5%. 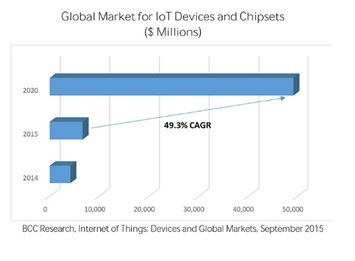 The IoT chipset industry will grow at a somewhat lower CAGR of 36.3%, primarily attributed to falling prices of chipsets over the forecast period. The many facets of the IoT have created some controversy around its definition. In an attempt at clarification, the Institute of Electrical and Electronics Engineers (IEEE) issued a white paper in May 2015, titled, "Towards a definition of the Internet of Things." To simplify the key point of the definition, the IEEE states that the IoT includes enabling technologies and components, and the mechanisms to effectively integrate these components. Often this comes down to a network that enables the integration and a set of components that can range from autonomous sensors to smartphones. While the phrase IoT was first coined by experts seeking to establish the universal electronic product code using radio frequency identification (RFID) systems, the many applications and industries enabled by IT networks with integrated components today is quickly redefining IoT beyond RFID, machine-to-machine (M2M) or any previous point interconnection technology. IoT encompasses all of these and through the Internet, mobile devices and data analytics, new layers of capability are being added all the time. "The IoT market is booming but lacks clear direction and many companies are trying to come up their own solutions. Top players such as Google, Samsung and Apple are creating products for which they see a market where as many start-ups are coming up with novel ideas for technology adoption. The race is on to become vendor of choice," says BCC research analyst Anand Joshi. "The nature of IoT applications is limited only by one's imagination." To illustrate the market opportunity presented by the current state of IoT, Internet of Things: Devices and Global Markets (IFT118A) has chosen to focus on the components rather than the mechanisms or analytics. Characterized broadly as IoT devices, these components include the ubiquitous sensors in all connectivity applications as well as other connectivity-enabled devices such as smartphones. This report also addresses the key subcomponents - the chipsets that comprise IoT devices. When added together, all these categories constitute a clear market for product manufacturers and service providers to target and take advantage of IoT growth. BCC Research publishes market research reports that make organizations worldwide more profitable with intelligence that drives smart business decisions. These reports cover today's major industrial and technology sectors, including emerging markets. For more than 40 years we've helped customers identify new market opportunities with accurate and reliable data and insight, including market sizing, forecasting, industry overviews, and identification of significant trends and key market participants. We partner with analysts who are experts in specific areas of industry and technology, providing unbiased measurements and assessments of global markets. BCC Research is a unit of Eli Global, LLC. Visit our website at www.bccresearch.com. Contact us: (+1) 781-489-7301 (U.S. Eastern Time), or email information@bccresearch.com.